Buying a leather jacket is a safe bet when you want a lifelong garment that never goes out of style. But with most things, excessive use over the years will make it loose its brightness and color. 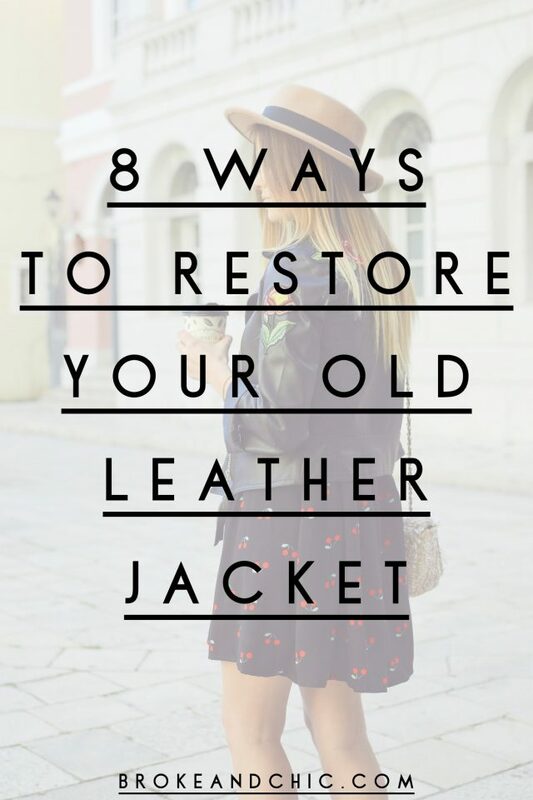 Thankfully there are ways to restore your old leather jacket to its former glory. To restore the shine of your leather jacket, the first thing you should do is clean it properly. It doesn’t matter if your leather jacket is top-notch Italian handmade leather or just some regular bomber you found at Goodwill, this step is essential from time to time. We recommend you wipe your leather jacket with a damp cloth or baby wipe. This will remove dirt from the exterior of the jacket. If there are any stains, consider ordering a stain remover spray meant for leather (can affordably be found on Amazon). To not create an irreversible issue, be sure read the directions and to do a test on a small part before spraying over large areas. Once you have cleaned it completely, you should let it dry for about 30 minutes. Just put it on a hanger and let it dry in the open air. After the leather jacket is 100% dry, you’ll need to hydrate it. Place some hand cream or body lotion onto a dry cloth and rub the surface very gently. This will eliminate the opacity of the leather and it will quickly restore some shine. If the lotion wasn’t enough to restore the leather’s shine, you may need to use an oil. Not only will oil hydrate and restore shine, but it will also restore the color. You can use olive oil or another vegetable oil. Just dip a dry cloth in the oil and gently rub the leather jacket with it. When you have finished passing the cloth soaked with oil on the leather, put a new cloth on the jacket but this time soaked in white vinegar and let it dry. To top off the care of the leather with this trick, you must mix olive oil and white vinegar in the same proportion and pass it again on the leather jacket. Finally, clean the jacket with a clean and dry cloth to finish removing the excess oil. With this solution you will help the shine last. The steps above are great for at home DIY when it comes to restoring your leather jacket, but you can also spend some money on product. If that’s more your thing, after wiping off dirt with a wet cloth or baby wipe, use a saddle soap. You can find saddle soap at any equestrian shop or on Amazon. This method is especially great for brown leathers. To maintain your newly restored leather jacket, you will have to do some maintenance to keep it hydrated and shiny. The frequency of this maintenance will depend on the type of leather and its age. The older the leather, the quicker it will dry out. Just mix one part white vinegar and three parts linseed oil and dip a dry cloth into it. Pay extra attention to the dry and stiff parts of the jacket. From there, wipe the jacket with a dry soft cloth and let it dry hanging up over night. Linseed oil is great at adding moisture. Finally, we advise you to always be careful and delicate with the leather, since otherwise, you could damage it even more. If you see that you cannot recover the brightness of your jacket, do not hesitate to take it to a dry cleaner to be cleaned with appropriate products that are specific for the leather. Note: Do not use these steps on a suede jacket. Suede will require a professional since it easily stains. Do you have a leather jacket? Let us know in the comments below.